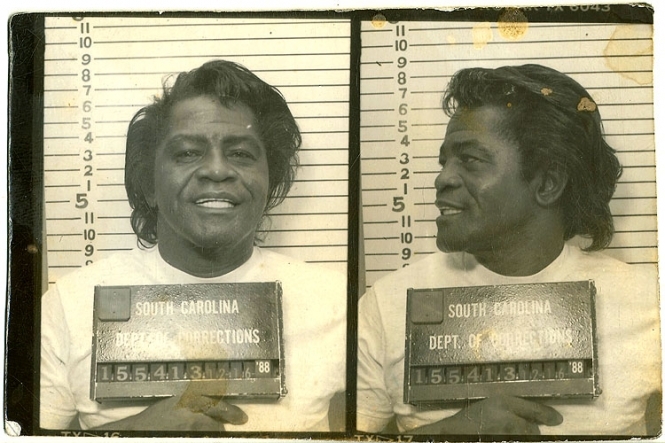 James Brown posed for this South Carolina Department of Corrections mug shot in December 1988 after a jury found him guilty of aggravated assault, weapons possession, and failure to stop for police. The so-called Godfather of Soul was nailed for taking cops on a drug-fueled car chase between South Carolina and Georgia. Brown, 55 at the time, was sentenced to six years in state prison, but was released on parole after serving just over two years behind bars. Submitted by nubnqween on Thu, 2011-04-07 10:14. That's a fly azz perm!